NightHawk™ was developed to solve the problem of “No Fault Found” (NFF) instances in electronic subsystems in aircraft. NFFs occur when a performance problem exists, but conventional testing does not find or indicate a problem. Initially developed, tested and validated on the Air Force VDATS system, NightHawk™ was subsequently implemented into various Automated Test Equipment (ATE) clusters. NightHawk functionality can be ported to the Navy’s eCASS platform to provide additional tools to improve test coverage of key electronic subsystems in Naval Aircraft to provide modern test and logging data analytic tools to handle aging aircraft problems and prolong the sustainability of the fleet. NightHawk can significantly reduce the Mean-Time-to-Repair (MTTR) – up to 60% – by pinpointing the specific electronic circuit boards that are defective, but still pass the legacy TPS tests. NightHawk can benefit both the military (NAVAIR, Air Force, Army Aviation) as well as commercial aircraft fleet operators such as FedEx World Services and other commercial airlines. Test program sets (TPSs) currently used to test and debug electronic problems on aircraft are largely developed by OEMs that support acceptance requirements of their subsystems decades earlier. With operation of the aircraft over decades in harsh environments, encompassing shock, vibration, lightning strikes and temperature extremes, the components in the subsystems can drift from their original values. 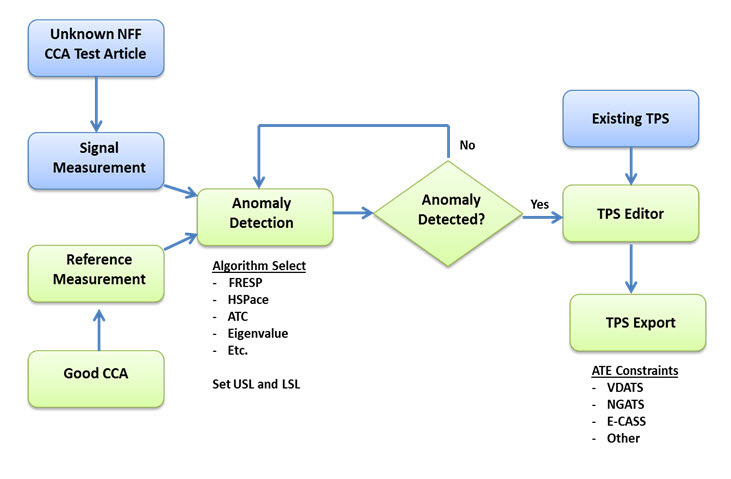 These variations can cause “soft faults” that go undetected by the original TPS, so NightHawk was developed to root-out these difficult-to-detect performance anomalies using advanced anomaly detection. These analysis capabilities rely on time and frequency-domain test software for thorough analysis of aging avionics and weapon systems that have been subjected to harsh environments, failures caused by parameter drift, and component degradation, all of which can result in elusive, intermittent ‘soft faults’ that negatively impact the mission objective and increase lifecycle maintenance costs.